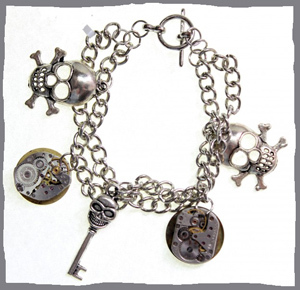 I didn’t have to understand the steampunk genre, however, to be drawn to the jewelry of BeeBull Designs when I ran across it at Show of Hands late last year. Allison Freeman and her sister Dana Biebel felt the same way when they discovered steampunk jewelry while browsing for fun in shops in Telluride and Ouray in 2013. 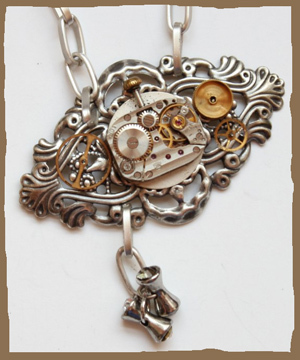 They were so intrigued, they started studying the genre and decided to make steampunk jewelry themselves as a creative outlet. Enhancing the name of their family of origin, they launched BeeBull Designs in October of 2013. Allison and Dana gather metal pendants and charms from everywhere they can find them – from thrift stores and E-Bay, from jewelry wholesalers, even from their own collections of costume jewelry. Most importantly, they buy parts of antique clocks and watches from a dealer in Europe. Watch gears a few millimeters in diameter are among the pieces Allison and Dana assemble to pay tribute to the era of mechanization. Sometimes these tiny gears dangle from pendants, and often they add complexity to larger gears and watch parts, as they do on the earrings pictured at left. 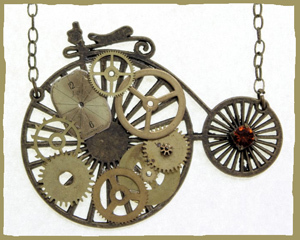 Even the bone rattler bicycle pendant in the necklace at right takes on the look of a machine with the addition of clock gears. Industrial-strength glue holds the gears and watch face in place. After 24 hours, Allison told me, she and Dana can forget about making any changes – those pieces are never coming off. An amber gemstone draws attention to the bicycle’s back wheel for visual balance. Color is a rare element in BeeBull Designs, however. Allison and Dana purposely keep their jewelry monochromatic as a rule, in keeping with an industrial look. Also consistent with that look are their matte-finished chains. Chains and earring wires of BeeBull Designs may be bronze, stainless steel, brushed brass, or coated aluminum. Dana, whose skin is very sensitive to metal, can attest to the fact that almost all of their selections of metals are hypoallergenic. Coated aluminum, which looks like brushed nickel, is often the chain of choice because of its light weight, especially when pendants are heavy. 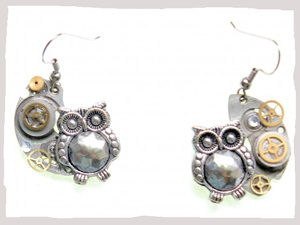 The online shop of BeeBull Designs has probably the widest selection of merchandise I’ve seen on an artisan’s website. To learn more about the steampunk genre, I watched for themes as I browsed. I found these: the sea (sea horses, anchors, mermaids and octopi), bugs (a wide variety from butterflies to spiders), and air travel (dirigibles, hot air balloons, planes, and wings). Skeleton keys and skulls and crossbones often appear in BeeBull Designs, too, like on the bracelet at left. Piracy fits the fantasy of sailing the high seas in the 19th century, Allison explained to me. The motif is a familiar theme in steampunk. By the way, scattered among the jewelry that you see at BeeBullDesigns.com are felted wool ornaments and birdhouses. Allison and Dana don’t make these — they sell them for a fair trade women’s co-operative. If you just want to see jewelry, enter “necklace” or whatever type you’re looking for in the search box. Allison and Dana have done a great job of naming their jewelry so that if you are interested in a particular motif, such as dragonfly, all the pieces that include dragonflies will come up. To see BeeBull Designs jewelry in person, drop by Show of Hands in Denver’s Cherry Creek North. If you’re really into fantasy — so much that you attend grand celebrations like AnomalyCon and StarFest — you may meet Allison and Dana seated beside a display of their jewelry and prepared to make more on site as their work gets swept away by a sea of fantasy fans. Allison and Dana will love your praise, Carolyn. Amazing, what art there is in gears! Glad you think so, Carol. Photos show the design but don’t really do justice to their character.